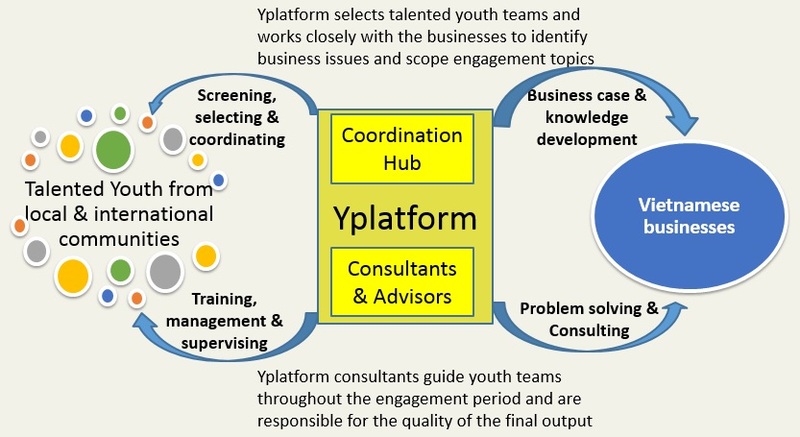 Yplatform Solutions – Student Consultant « Yplatform | global insights – local impact | Connect. Empower. Inspire. We are looking for SOLVERs… Are you ready? Yplatform Solutions is seeking for talented students from leading universities in Vietnam and overseas who want to challenge themselves in SOLVING hard business questions and VENTURING deep into the operations of fast-growing Vietnamese companies. And last but not least, the chance for you to create and drive impacts that last in the local business community. If the above sounds like what you want to pursue, why not challenge yourself to join as a SOLVER of Yplatform Solutions for a one-of-a-kind opportunity to see how far you can push yourself to? 1. Rigorous training will start on August 2013 (for the 1st batch and will be conducted on weekends during a 4-week period, focusing on market research, problem solving, modeling, presentation and communication skills. 2. Project matching will take place depends on skill/expertise suitability and project scope/timeline/availability. You will also have challenging assignments along the way to strengthen your business acumen and your understanding about Vietnamese businesses, to prepare yourself in professional consulting engagements. 3. You will serve on a client engagement with a fast-growing Vietnamese company (5 – 10 weeks, 20 – 40 hours/week depending on individual project scope and timeline), under the guidance of professional consultants from leading consulting firms such as McKinsey & Company, Boston Consulting Group, Bain & Company, etc. and experienced mentors from various industries. Applicants who are based in either Ha Noi or Ho Chi Minh City in, at least, the next 6 months are preferred. However, if you are in other countries in the world, you are still welcomed to apply. Expected time commitment during project engagement is 20 – 40 hours/week depending on individual project scope and timeline. Are you ready for one of the most exciting journeys to learn and solve hard questions? Recruitment is on a rolling basis so do take note to apply early. Should you have any questions, please feel free to email us at solve@yplatform.vn and we will reply as soon as we can. Please note that the application period for the 1st batch has now ended. However, should you wish to be considered in FUTURE WAVES of Yplatform Solutions (which might happen in the next few months), you can still click HERE to submit the application form. To facilitate the establishment of industry knowledge and business case resources tailored to Vietnamese business conditions. Towards that end, we aspire to create a strong and vibrant platform to help strengthening Vietnam’s global competitiveness in multiple aspects. Please click HERE for more information about Yplatform. Yplatform is the organizer of Ychallenge – a premier international case competition on leading Vietnamese businesses. Participants from different countries challenge themselves in extensive case studies about Vietnamese companies, undergo case-cracking training and company field trips as well as being exposed to networking opportunities and panel discussions. Ychallenge 2011 and 2012 were organized in Singapore and Vietnam with the participation of 1500+ participants from 15+ countries. Past corporate partners include Vinamilk, VNG Corporation, Becamex, PNJ, DongA Bank, Tropdicorp, and McKinsey & Company. Click HERE for more information about Ychallenge.